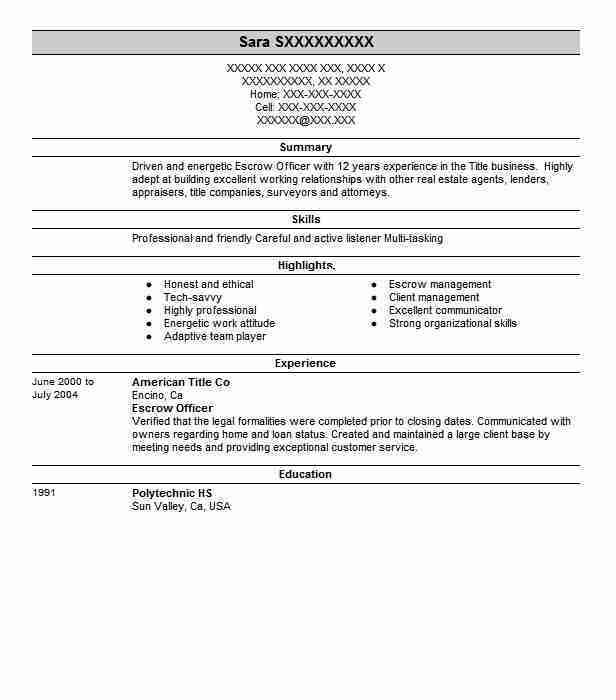 Reliable Escrow Officer who has considerable experience setting up and managing personal mortgage escrow accounts. Adept at mathematical calculations understanding complex legal and insurance issues and establishing a working relationship with all parties involved in a house closing. Specializes in residential and small commercial mortgages. Responsible for establishing all escrow accounts for all new residential mortgages. Assisted in preparing and executing all residential mortgage closings. 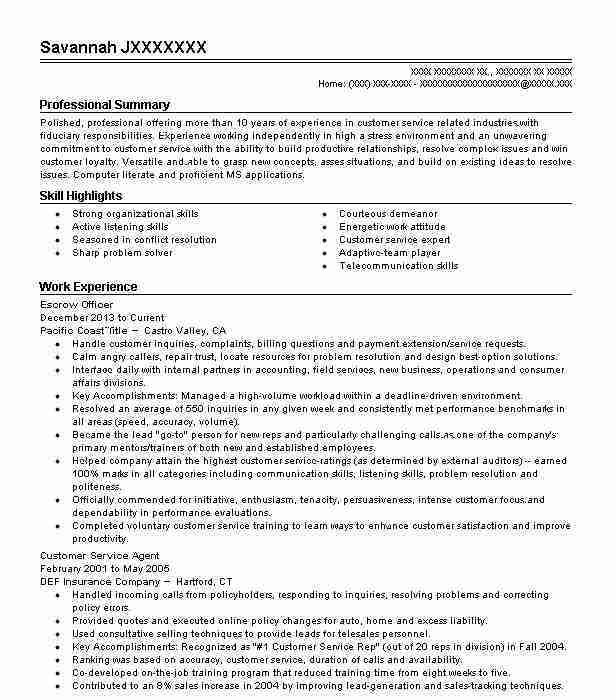 Acted as the customer service representative for mortgage buyers whenever they had questions. Responsible for creating all new residential mortgage files and completing all escrow arrangements prior to closing. Worked closely with title insurance representatives attorneys and bank representatives to help facilitate a smooth closing of each mortgage. Often assisted in developing promotional materials that were used to bring in new mortgage customers. Responsible for creating each new residential mortgage file and maintaining all of the escrow papers for each closing. Responsible for coordinating all residential mortgage closings and making sure that all mortgage checklists were completed. Networked with attorneys and others in the mortgage industry to bring in mortgage referrals. 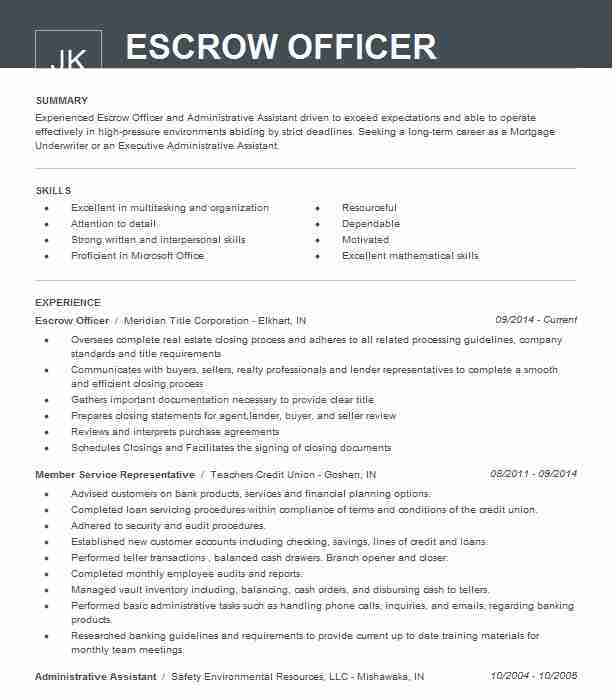 There are plenty of opportunities to land a Escrow Officer job position, but it won’t just be handed to you. 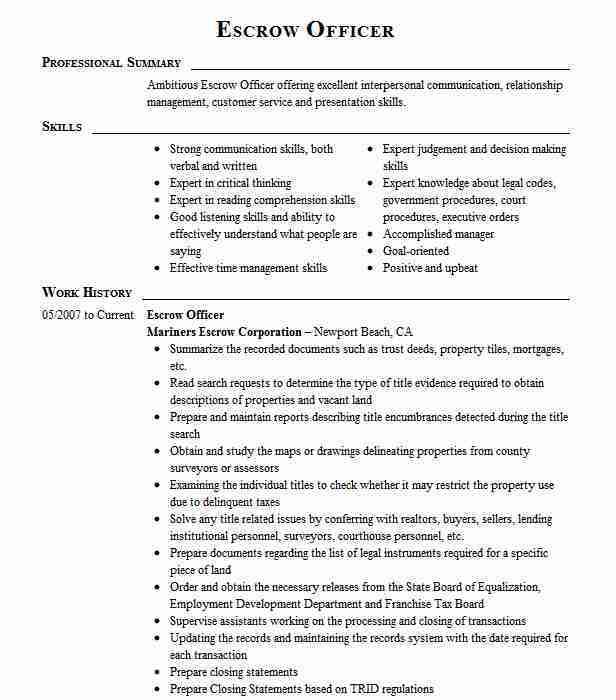 Crafting a Escrow Officer resume that catches the attention of hiring managers is paramount to getting the job, and LiveCareer is here to help you stand out from the competition.